This is my kitten, Shrimpbait. 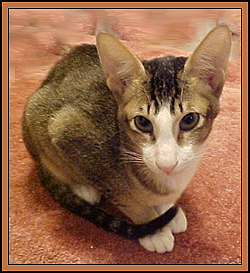 She is a darling 6 months old ebony ticked tabby and white bicolor Oriental Shorthair. Shrimpbait is one of a litter of four kittens. The whole litter took a long time to grow up. In fact they were 6 months of age before I even considered placing any of them in a pet home. It was then that my husband noticed something was wrong with Shrimpbait. Being an architect, he expects things to be straight and true. He looked at Shrimpbait and said, "That kitten leans to the right." Being his wife, I didn't pay any attention to what he said. Then my friend Beth was visiting. She looked at Shrimpbait . . . and said, "That kitten leans to the right." So now I decided to pay attention. I took a good look at Shrimpbait. She did lean to the right! My mother has untreated scoliosis and I was treated for scoliosis as a 12 year old child . . . and that was what it looked like to me that Shrimpbait might have. Scoliosis is a sidewards curvature of the spine in any portion except the neck. After examining Shrimpbait closely it seemed her backbone had a definite twist to the right. "No, the first half of her body leans to the right." My veterinarian immediately suggested I bring Shrimpbait in for an x-ray, which I did. The x-rays showed that Shrimpbait had scoliosis combined with a form of lordosis (arching of the spine) and thoracic vertebral fusing meaning some of the vertebraes of her spine were fused together and no longer flexible. In the cat with scoliosis the vertebrae have become fused together. There is no space between the vertebrae of the backbone. Although Shrimpbait will never win any awards for good posture, it should not affect her life span or quality of life. Her condition appears stable and non-progressive. It presents no health concerns and is basically cosmetic in nature. Nonetheless, Shrimpbait will remain with me as a treasured pet. If her condition did progress, she might lose some flexibility and have problems cleaning her hind end but it is still a manageable condition. Very rarely, a cat with this condition exhibits neurological signs of pain, weakness, or paralysis due to compression of the spinal cord. Debbie Borner raises Oriental Shorthairs under the PrairiePaws prefix, specializing in the cinnamon/fawn colors in most patterns including bicolors. PrairiePaws had the first cinnamon CFA Regional Winner & Grand. Debbie is also the Founder & President of The Cat House, a "no-kill" Cats Only shelter, which has found homes for over 400 cats and kittens including several purebreds and two FIV+ cats. The shelter also is actively involved with a TNR program.